Recent CUSD Governing Board actions, including approval of new field turf and a gym roof at Coronado High School and relocation of TK/K classrooms to the Village main campus from the Early Childhood Development Center, have drawn attention to the district’s ongoing budget challenges. Last fall the Board adopted a Long Range Plan, which included a planned spend down of reserves in order to minimize impacts to programs until the district reaches Basic Aid funding status (approximately 2025-26). Additionally, the Board tasked Superintendent Mueller and his staff with closing an ongoing $1.1 million structural deficit. At the March 7 Board meeting Assistant Superintendent Donnie Salamanca presented the district’s 2nd Interim budget, which outlined the need for careful fiscal planning. With per pupil revenue from the Sacramento essentially stagnant and beyond our control, significant spending changes are required. The field turf and gym roof replacement are one-time expenses, while the TK/K move will be an ongoing budget efficiency. A common misconception is that CUSD receives funding from local property taxes, however the district is actually funded according to the Local Control Funding Formula (LCFF) determined by the State. LCFF was adopted in 2013 and determines public school funding based on student demographics. English Learners, Low-Income, and Foster Youth are the measured demographics. CUSD’s “concentration” of these identified pupils is approximately 11% vs. the statewide average of 55%. As a result CUSD receives significantly less funding than most other districts (as an example: San Diego USD receives approximately $1,600 annually more per student than CUSD). While the district has been fortunate to receive strong community support through the Coronado Schools Foundation, PTO’s and other partnerships, we continue to be underfunded relative to most other districts in California. 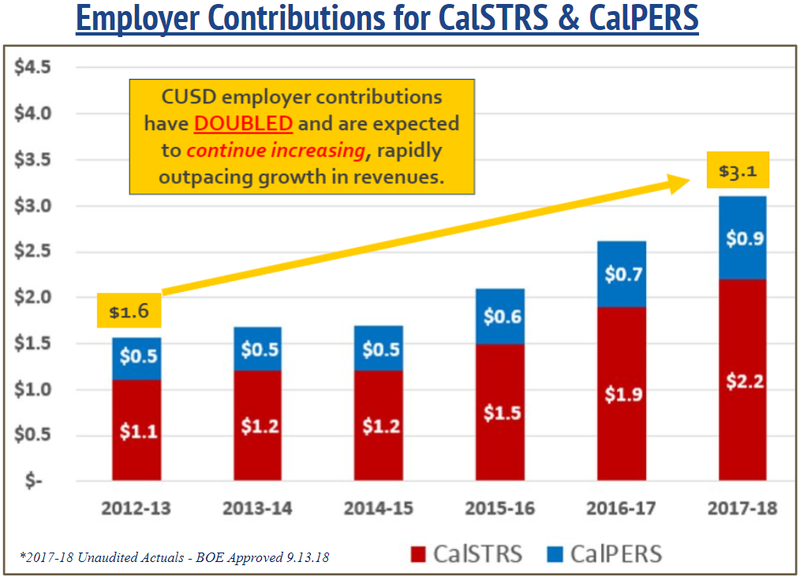 Another noteworthy budget factor, also beyond CUSD’s control, is the significant increase in state mandated contributions to employee retirement programs (STRS/PERS). Employer contributions to these programs have doubled since 2012-13. As Mr. Salamanca reported in his address to the Board, the Governor’s Proposed Budget may provide some relief by keeping STRS contribution increases at bay through 2021. However, the upward trend is expected to continue as STRS/PERS fund managers see lower than expected returns in investment. Investment returns have a direct correlation to employee/employer contributions. Employee contributions are also increasing, tough not as drastically as those required by employers. Special Education costs are another significantly underfunded mandate that the district must absorb. School districts are required by State and Federal laws to provide a free and appropriate public education (FAPE) for all students, including those with disabilities and special needs. CUSD serves approximately 380 students with varying special education needs. These services often come with a much higher cost than State and Federal funding cover. The unfunded costs must come from local General Fund sources. Of the $7.7 million spent on Special Education in CUSD in 2016-17, 51% came from the district’s General Fund. State sources provided 41% and only 8% came from Federal sources. These percentages have remained relatively stable over the last six years. Thanks to the remarkable team of CUSD educators that are committed to the work of supporting every child, every day, our 51% local contribution is actually almost 14% lower than the statewide average of 64.5%. Recent activity in Sacramento seemed to look promising to provide additional funding for Special Education, but again CUSD is not eligible. A recent education trailer bill, “Special Education Concentration Grants” seeks to provide additional funding to support the underfunding of SPED students by providing approximately $12,000 per eligible student. Unfortunately, should the trailer bill be enacted as written, CUSD would not be eligible to receive any funds because of our student demographics. Just like with LCFF, Coronado demographics continue to put the district in the “Loser” category for State funding. As long as CUSD is at the mercy of the State, rather than local property taxes, this will always be the case. The Governing Board, Administration, and Union leadership are actively engaged in advocacy efforts to urge our elected representatives in Sacramento to revise the trailer bill language to allocate these funds more equitably to all districts. Students with special needs are present in all school districts. Despite significant budget challenges the sky isn’t falling in CUSD. The district leadership is committed to proactively managing its budget. Difficult decisions are not easy or popular, but procrastination does not address our funding realities; we must remain strategic, decisive, and intentional. We refuse to postpone difficult decisions until the brink of insolvency. 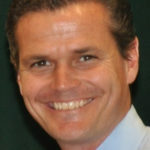 To do so would lead to significant cuts to programs and experiences that make CUSD unique from our neighboring districts.